Vault of Light: Just the two of us. A few posts ago I mentioned moving to a new server and boy have I felt a lot better since I did! I moved two characters over leaving the rest behind. I don't possess the ability to play on multiple servers so my other characters are effectively dead to me. This is giving me time to really focus on just a few characters for pretty much the first time during this expansion. Throughout MoP with having put a lot of my focus into gold making I'd gotten into a routine of doing almost the same thing every day. Logging into each of my characters to do their profession cooldowns and crafting / posting. Leaving little time for much else. By the time I was finished I seldom felt any desire to run LFR or hunt down some achievements. And with so many max level characters I never really knew where to start. For the past three weeks I've actually been doing LFR, capping my Valor, gearing my Hunter a little better and generally having a lot more fun in game. I've also joined a guild of people who seem really nice. As well as bumping into an old friend from BC. Of all the servers and all of guilds for me to join I just happen to end up on hers which is crazy! I'm on a trial at the moment for the next few days but hopefully I'll get a permanent spot in the guild. I've been joining in on Achievement runs at the weekend which have been super fun. It's been a while since I did anything like that so I've been really enjoying it! Korla and Telnari are two of my oldest characters and have always had a pretty strong place in my heart. I consider my main server to be whichever Korla is on but getting back to grips with Telnari who I mained for a short time during BC has been fantastic. What about you - are you an altaholic who struggles to focus on just one thing or character at a time? Are you one of those few and far between people who have or have always had just one or two characters? I have one of these daily routines that you mentioned. Every day I log 10 characters and do the daily profession cooldown and the Tiller-farm. It's not really a fun thing to do, but I can't make myself stop either. I wish the farm was account-wide actually, which I know is selfish; clearly I should just learn to control myself. Other than that I mostly play my main; raids, heroic scenarios and soloing old raids. And I do some world bosses and LFR on alts now and then. Yeah I was much the same. Most of my 90's I stopped playing as soon as they hit 90. 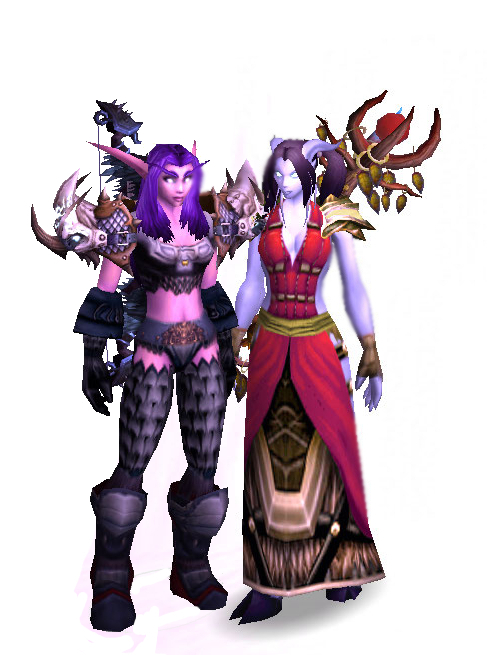 I'd mog them to something cool so they looked pretty on my character screen and pretty much not actually use them for anything other than professions and my farms too! I've enjoyed moving away from the daily routine. I log in and do what I want to do now not what I feel as though I have to do, like I was. I'm glad the server transfers has worked out so well for you! I'm the complete opposite in the sense that I've been solely focused on 2 characters so far this expansion and I'm now working on alts - only one of which is in Pandaria (the rest are all lowbies). Oh wow. I think everyone I know has been the complete opposite to you! I've been pottering around on a little Monk over the past few days but she's teeny weeny! Thanks sweets. It's been really nice. I've had a few friends return to the game as well over the past week so things are definitely looking up!